Learn more about Green & Black’s here. Buy Green & Black’s chocolate on Amazon. Chocolate is one of my favorite tea time treats because … well, I’m a chocoholic! This is an exquisite dark chocolate bar, and I chose to drink this Black Tea from Shan Valley with the chocolate. The roasty flavor as well as the other notes (hints of smoke, caramel, nut, earth and toast) of the tea complemented the deep, rich flavor of the chocolate in these mini-bars. These tiny bars that were in my November Love with Food box are so cute! They are .53 ounces, and when you open the wrapper, it looks like a miniature chocolate bar, complete with the “break lines” that you’d find on a larger bar. Put simply, this is rich and delicious. One of the better dark chocolate bars I’ve encountered. There is a good snap to this. The chocolate tastes rich, sweet with just the right amount of bitterness to keep things interesting. 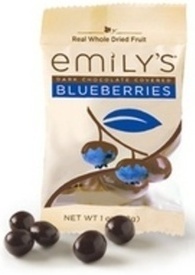 There is a deep fruity character to the chocolate. This is definitely a chocolate bar that I’d pick up again when I’m craving dark chocolate. I’m glad that I have seen this chocolate in my local Whole Foods. I’ll be grabbing a bar next time I shop there! Dark Chocolate Dreams from Peanut Butter & Co.
Our all natural peanut butter blended with rich dark chocolate. It’s like a peanut butter cup in a jar! Great on a sandwich, but just as wonderful spooned over ice cream, spread on fruits, or simply eaten out of the jar. It’s equally delicious as an ingredient in your all-time favorite baked goodies like chocolate cake and bread pudding. I received a sample of Dark Chocolate Dreams in my February Goodies Box. My overall impression of this product is very good – I like that this is very peanut butter-y … the chocolate is there but it doesn’t overwhelm. Don’t get me wrong, the chocoholic in me is all about as much chocolate as possible, but, the parent in me is more inclined to purchase this product for my daughter knowing that there’s at least some peanut butter goodness to this. It is sweet, creamy, peanut-y, and salty. Luscious! On the graham crackers, this peanut butter is insanely good. I love the way the salty and sweet interact this way. The salty really comes out to “play” on these graham crackers, and I like the way the chocolate tastes with the salty notes. On the apple, I found that the sweetness came out more. I liked how the juiciness of the apple kept my mouth from feeling dry from the peanut butter. But my favorite way to enjoy this chocolate-y peanut butter – by far! – is atop the banana nut bread crisps. My favorite way to enjoy peanut butter is with bananas, and then to add chocolate to it … it was heaven. YUM! I think I’m going to pick up a jar of this the next time I see it on a grocery shelf. My daughter, who is a nutella fan, would really enjoy this, I think! And I’m envisioning how good this will taste on a peanut butter, banana and marshmallow cream sandwich. Oh … goodness … just the thought of that is enough to send me to a very happy place! 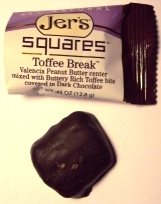 Toffee Break Dark Chocolate Jer’s Squares are crafted with buttery rich toffee bits mixed with all natural Valencia peanut butter covered in premium dark chocolate. I received a package of Jer’s Squares Toffee in my February Love with Food box. I think that these squares could go with just about any tea, but I wanted to choose a pure tea – that is, an unflavored tea – so that the flavors of the tea wouldn’t attempt to compete with the delicious flavors of dark chocolate, peanut butter and toffee because that’s what I wanted to taste! Instead, I chose a tea that would complement the flavors of the Jer’s Square … I chose Master Han’s Wild Picked Yunnan Black Tea From Verdant Tea … and what a delightful pairing it was! The rich tea with it’s hints of spice and unique complexity brought the flavors of the square into focus, while the chocolate seemed to enhance the spice notes and bring forward some of the underlying layers of the tea. The rich dark chocolate is a thin shell of chocolate, just enough to give it a delicious, chocolate-y taste, but not so much that it overpowers the flavors locked inside the shell. Peanut butter! Creamy, delicious peanut butter and tiny bits of buttery toffee. Crunchy little bits, and a smooth creamy peanut butter filling. I think the peanut butter is a really interesting and compelling component in these delicious squares – I don’t think I’ve ever tasted toffee and peanut butter together before … but I like it! Delicious! But then, I’m not surprised … it’s chocolate! It’s peanut butter with chocolate! And it’s TOFFEE with chocolate! I mean, come on … seriously? What’s not to love? A perfect treat – goes so nicely with my tea! 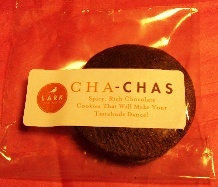 Lark combines intense dark chocolate with spice and heat for the ultimate chocolate-lover’s treat. These are perfect with coffee but would also make excellent gourmet oreos or ice cream sandwiches. These cookies are available on Petit Amuse. I couldn’t resist trying these cookies with this Hong Jing Luo from thepuriTea. A perfectly lovely match, these two! The cocoa notes of the tea work wonderfully with the dark chocolate flavor of the cookies, and I notice more of the sweeter notes as well as the savory qualities of the tea when enjoyed with the cookies … while I notice the smooth chocolate seems to glide over my palate while simultaneously being hit by the zesty spice. On their own, this tea or this cookie would be really amazing, but together, it becomes a truly delicious culinary experience! The first thing that struck me about this cookie is it’s weight. Yes, you read that correctly. The weight. It was heavy for its size. Normally, a cookie this size would be very light – so light you wouldn’t really notice it. And while I wouldn’t say that this cookie is heavy, exactly, it seems to be more substantial a weight than other types of cookies this same size. To satisfy my own curiosity, I weighed the cookie – .8 oz. Then to just amuse myself, I took out a cookie of similar size (a raspberry thumbprint shortbread cookie from Knott’s Berry Farm – something I had on hand) and it weighed in at .4 oz. After my fascination with the weight of this cookie subsided, I decided to take a bite, which lead to my next surprise about it … it’s texture. It’s SOFT and dense. After eating the Salted Rosemary Shortbread which is crispy, I kind of expected a crispy texture here too. But this is soft. My teeth sort of sunk into the cookie, as I tasted the rich chocolate-y flavor. Then I notice the kick of spice. This reminds me a bit of one of those gourmet candy bars that are chili pepper infused – it has that sweet-spicy quality that I love so much! But this might be even better, because it’s in a cookie, so I get some rich, buttery goodness from the dough which gives the overall experience a very creamy sort of experience that complements the dark chocolate notes so well without making it taste like milk chocolate. I love the dark cocoa here. I can really taste the nuances of the chocolate – the fruit notes and the deep roasted flavor. This isn’t filled with any unnecessary goodies – no nuts or chips or other bits and pieces – and like I said, it doesn’t need them. This cookie focuses on the flavor of dark, rich chocolate and spice. And it’s really executed so perfectly, that I find myself wanting nothing more from them. These are exquisite cookies – perfect for the grown up palate. This is something that you can put in the family cookie jar and not have to worry ab0ut the kids raiding – while they might think these are “OK” – I don’t think they’re going to love these the way a more mature palate would. It’s got a delicious chocolate-y sweetness, and it’s “kicked up a notch” with that spicy note. YUM! And just a follow up on the Salted Rosemary Shortbread cookies (also from Lark Fine Foods and originally reviewed here) – they are every bit as good as I remember them. Sweet and with just enough savory notes to give it a well-rounded flavor and palate-pleasing balance. And oh-so-deliciously buttery! Dark semisweet chocolate and natural peppermint oil. Creamy dark chocolate gives way to refreshing natural peppermint; the flavors of chocolate and peppermint swirl on your palate, ending in a cool mint finish. 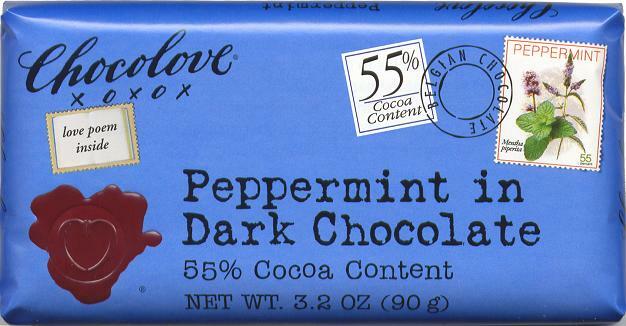 Learn more about Chocolove on their website. As this is a fairly large chocolate bar (and so delicious!) I wanted to savor it on several occasions so I broke it up into thirds. The first third, I enjoyed with Emperor’s Gold from The Tao of Tea. I love how the deep, rich, chocolate-y tones of the tea complemented the dark chocolate flavor. With this tea, the chocolate was more focused than the peppermint, although, the peppermint was still quite prominent. With my second tasting, I tried a green tea: Organic Sencha from Den’s Tea. While this was an enjoyable pairing, I didn’t find that the green tea really highlighted the flavors of the chocolate or the mint, and I think that a Moroccan Mint might have made a better pairing. Finally, with my third tasting, I brewed this Silver Needle from Rishi Tea. I think that the chocolate brought out some of the mineral-y kind of notes in the tea, which I didn’t really experience when I drank the tea previously. It was interesting trying this with all three teas, but I think my favorite was the Emperor’s Gold. I don’t shop at Whole Foods often because, let’s face it, it’s not the cheapest place to procure one’s groceries. And as I have a family to feed and we are on a tight budget, like so many others out there, I get most of what I need at a “bag-your-own-groceries-and-save” type of grocery store. However, on occasion there is something I want or need that can only be found at a “natural foods” grocery store. And when I do happen to visit my local Whole Foods market, there are a couple of areas that I always visit. One of them is the chocolate aisle. I don’t always buy chocolate, but, as a chocoholic, I actually even enjoy the drool factor of walking through the chocolate aisle. Sad, yes, but true. This is one of the bars I picked up on my most recent visit. I don’t usually choose a minty type confection – I mean, I like them alright, but I usually prefer a nutty confection to a mint one – but, I was in the mood for mint chocolate and this is the bar that caught my eye. As I mentioned above, this was a fairly large bar (3.2 ounces), so, I decided to break it into thirds so that I could extend my chocolate enjoyment. I’m sure that if I wanted to, I could probably have polished off the whole bar in one sitting, but, I wasn’t looking to over-indulge, just satisfy my chocoholic sweet tooth craving. When breaking the bar, I listened for the snap, and there is a slight snap to this… however, since it is 55% cocoa, it isn’t quite as sharp a snap as when I’d break a higher cocoa content bar. The texture is soft and silky, not quite as creamy as a milk chocolate, but much richer. Deliciously sweet, with hints of bitterness to keep it interesting. The mint is not an overpowering flavor, I find the two components are very harmonious. A very enjoyable bar, I prefer this to the creamy peppermint patty type of candy bars, because I find those a bit too sweet for my liking. This focuses more on the chocolate than the mint, and for this chocoholic, that’s just the way I want it!